Autumn is a vicious season for Native Americans. There's Columbus Day. Indian costumes on Halloween. Thanksgiving. You've even got Native American Heritage Day LITERALLY on Black Friday every year. And then — you guessed it — it's back to fantastic fanatical football buffoonery. On Thursday, The Huffington Post sports section tweeted a photo of a man playing Indian during a Washington football team game in New Jersey against the New York Giants. 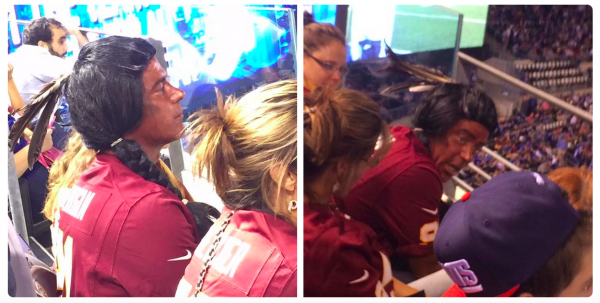 The unidentified sports fan was painted in full redface and wore what appears to be a wig. Appears to be a wig? Appears to be? Well, there is no fooling you Chief Eagle Eyes, now is there? Great Cloud Father has truly gifted you with heap big magic to be able to see through that disguise. For the love of God, does that getup really warrant a qualifier? Your shaming this fellow as a racist, do you really need to extend to him the benefit of the doubt regarding his hair? Are you truly that cowardly, or just that stupid? Ooooooo ... I don't want someone to contradict me in the comments section and suggest that was really that guy's hair ... I better say "appears to be" just in case!